I think I'm in love. Just trying this out, so it's too soon to say, but this freeware file manager has received good reviews in alt.comp.freeware. It's called UltraExplorer. 2xExplorer was OK but it limits you to 5 favorite folders. This one has a Mac-like "column view" (see below). Dual panes if you want them. Also a handy command prompt at the bottom. posted by Jonathan at 7/07/2007 06:46:00 p.m.
By David, at 7/11/2007 9:41 a.m. Thanks David. Alas, I wish it were free though. By Jonathan, at 7/11/2007 10:58 a.m.
thanks for turning me on to UltraExplorer. I had been using FileAnt but UE is much faster and has way more features! By Dabbler, at 7/17/2007 6:58 p.m. I just had a look at Salamander but it seems a lot like FileAnt but isn't free. UE seems more feature rich, I really like features like tabbed panes, column view a la OS X, etc. By Dabbler, at 7/17/2007 7:01 p.m.
Hey dabbler - yeah it's cool, isn't it! 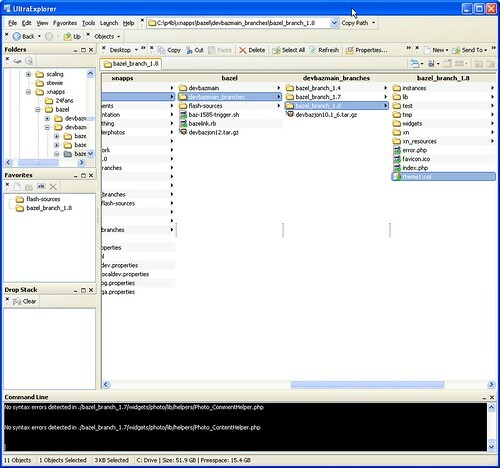 By Jonathan, at 7/17/2007 9:01 p.m.
Can UltraExplorer be made to outright replace the Windows Explorer, the way that Notetab can replace Notepad? By Disquiet, at 9/08/2007 5:48 p.m.
Hi disquiet - not sure - wouldn't recommend it though, as I've found it's far from perfect. I'm trialling Directory Opus which can replace Windows Explorer. It's great, but I'm not sure I want to shell out $80 for it. By Jonathan, at 9/08/2007 9:28 p.m.
By gumuruhsspj, at 12/24/2012 9:43 a.m.